Kellogg Community College is holding open auditions for the College’s spring musical production “The Bomb-itty of Errors” next week on campus in Battle Creek. 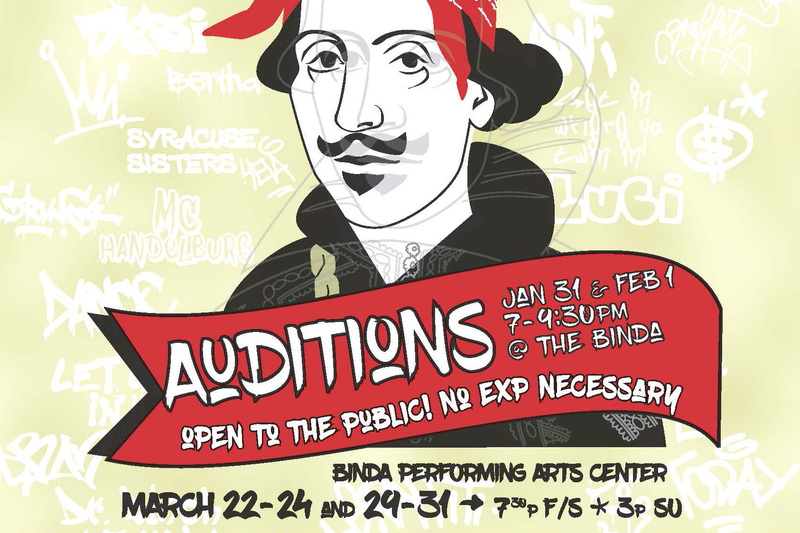 Auditions for the show – a hip-hop update of William Shakespeare’s “The Comedy of Errors” – will be held from 7 to 9:30 p.m. Thursday, Jan. 31, and Friday, Feb. 1, at the Binda Performing Arts Center on KCC’s campus at 450 North Ave. The show opens March 22, with additional showings Mach 23, 24 and 29 through 31. “The Comedy of Errors” is a comedic farce that tells the story of two sets of identical twins who happen to converge in the same town, leading to misunderstandings, arrests, bedroom mishaps and more. “Bomb-itty,” billed as an “ad-rap-tation,” tells that story through hip-hop music and the eyes and voices of rap MCs, cops, a Rastafarian “herbal doctor,” bike messengers and others. No experience is necessary to audition for the show. For more information, contact KCC Theatre professor Brad Poer at poerb@kellogg.edu or 269-565-7869, or visit the KCC Theatre Facebook page at www.facebook.com/kcctheatre.